Are we about to get a Secret Donald Glover / Rihanna Movie? 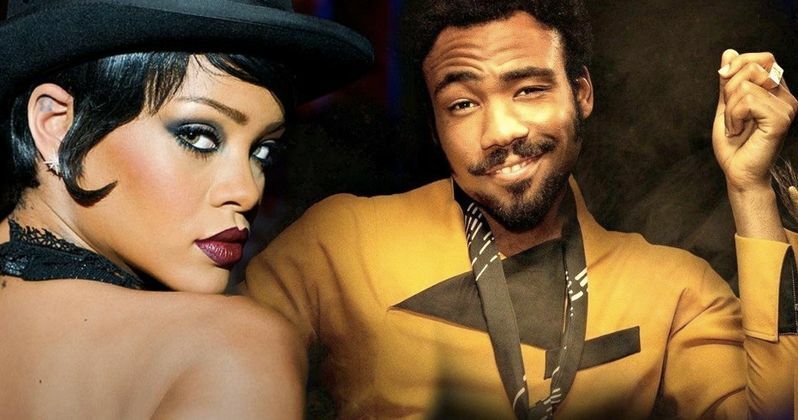 A few pictures of pop star Rihanna and Donald Glover have been circulating around social media and fans are speculating that they're making a secret movie together. The main photograph of the duo contains the caption: "On the set in Cuba." Glover and Rihanna are reportedly working on a "musical movie," which could in actuality be a music video. They're down in Cuba with director Hiro Murai who has worked with Glover on the hit series Atlanta as well as the "This is America" music video. Other pictures from the set look a little more ambitious than a music video. Neither Rihanna nor Donald Glover have posted anything about this mysterious new collaboration on social media as of this writing. The project in question is reportedly called Guava Island, though that may only be a working title for the production. Sources in Cuba say that the duo is working on a "musical movie." It's also been rumored that Letitia Wright and Nonso Anozie are in the project as well, with some scenes taking place in a textile factory. Rihanna is reportedly playing a seamstress. Again, this could just be for a new music video for either artist. Donald Glover has been hard at work on the follow up to his 2016 album Awaken My Love! And Rihanna in also working on a new album at the moment. Glover and Rhianna might be making a cameo on each other's different projects. Or, there's even the possibility that it could be for a television show with Hiro Murai on board. Whatever the case may be, fans are definitely excited about what the two could be working on together. Rihanna has been stretching her acting muscles quite a bit lately. She appeared in the fifth and final season of Bates Motel and also had a major role in Luc Besson's Valerian and the City of a Thousand Planets. Most recently, Rihanna appeared in the all-female heist film Oceans 8. The musician/actor recently revealed that she was working on the follow up to 2017's Anti record. Sources close to the project say that Rihanna's new album is going to be "insane," which could be why her and Donald Glover are down in Cuba filming something. Donald Glover has had a huge year, from winning Grammys, Golden Globes, Emmys, appearing as Lando Calrissian in Solo: A Star Wars Story, and having one of the biggest singles and music videos of the year with "This is America." Most recently, the artist released a summer group of songs that were far more upbeat than "This is America." Glover releases his music under the Childish Gambino moniker and has announced that the upcoming record will be his last as Gambino, leaving fans heartbroken and a bit confused. As for what Rihanna and Glover are working on in Cuba, we'll just have to wait and see if it turns out to be a feature-length musical. You can check out some pics of the two below, thanks to the Fenty Stats Twitter account. More about the project: The film, directed by Hiro Murai, will use several locations in Havana, including a textile factory located in the Alamar municipality. So perhaps Rihanna interprets the character of a seamstress.